The creator of the Cronut and innovator of all things desserts, Dominique Ansel, has set his sights on reinventing soft-serve. The creator of the Cronut and innovator of all things desserts, Dominique Ansel, has set his sights on reinventing soft-serve. Dominique Ansel Kitchen in New York City is launching its ice cream window tomorrow with two awesome soft-serve flavors: burrata (the ultra-creamy fresh Italian cheese) with balsamic caramel and a whole confited strawberry, and gianduja (think Nutella but better) topped with salted hazelnut brittle, orange mist and sea salt. 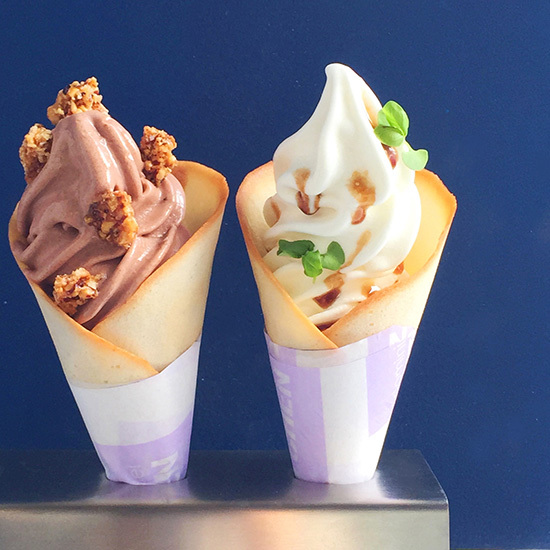 These brilliant-sounding creations will be available in house-made cones for $7 on Fridays, Saturdays and Sundays from 12 to 9 p.m.
Related: Best Ice Cream Spots in the U.S.